The nearest single star to the Sun hosts an exoplanet at least 3.2 times as massive as Earth — a so-called super-Earth. One of the largest observing campaigns to date using data from a world-wide array of telescopes, including ESO’s planet-hunting HARPS instrument, have revealed this frozen, dimly lit world. The newly discovered planet is the second-closest known exoplanet to the Earth. 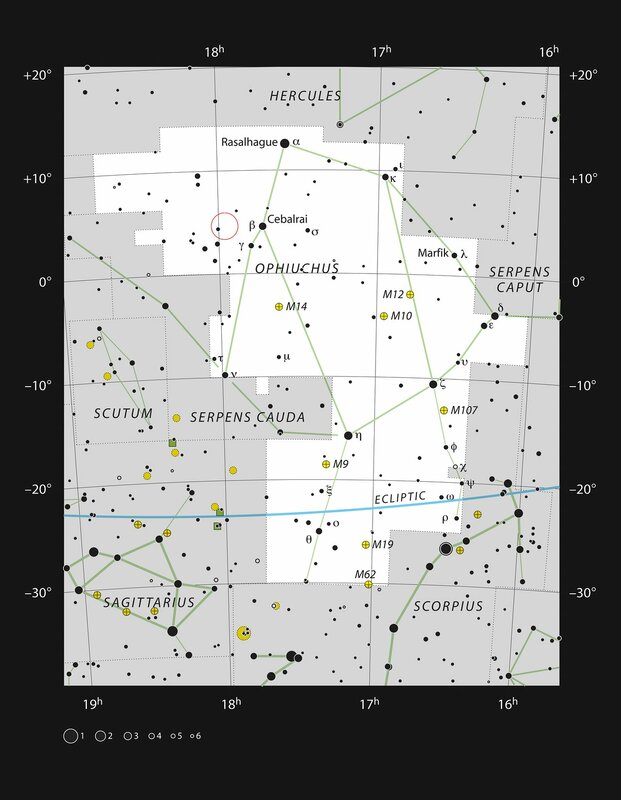 Barnard’s star is the fastest moving star in the night sky. The planet, designated Barnard's Star b, now steps in as the second-closest known exoplanet to Earth . The gathered data indicate that the planet could be a super-Earth, having a mass at least 3.2 times that of the Earth, which orbits its host star in roughly 233 days. Barnard’s Star, the planet’s host star, is a red dwarf, a cool, low-mass star, which only dimly illuminates this newly-discovered world. Light from Barnard’s Star provides its planet with only 2% of the energy the Earth receives from the Sun. 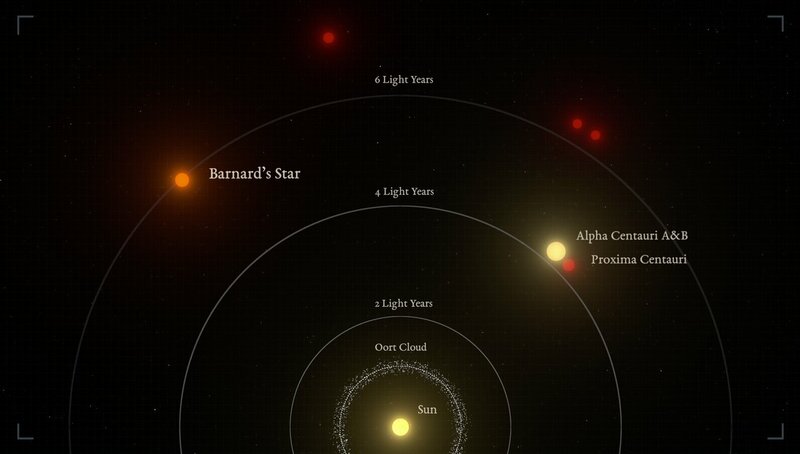 The only stars closer to the Sun make up the triple star system Alpha Centauri. 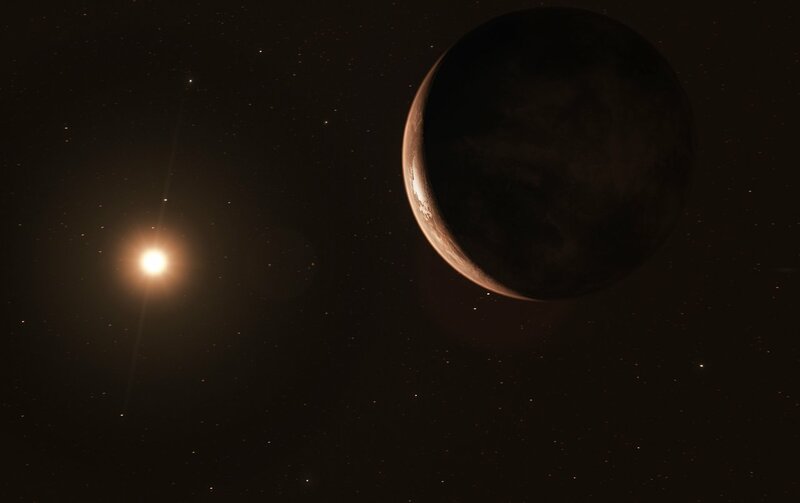 In 2016, astronomers using ESO telescopes and other facilities found clear evidence of a planet orbiting the closest star to Earth in this system, Proxima Centauri. That planet lies just over 4 light-years from Earth, and was discovered by a team led by Guillem Anglada Escudé. The total velocity of Barnard’s Star with respect to the Sun is about 500 000 km/h. Despite this blistering pace, it is not the fastest known star. 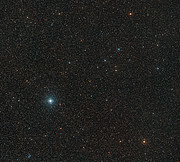 What makes the star’s motion noteworthy is how fast it appears to move across the night sky as seen from the Earth, known as its apparent motion. Barnard’s Star travels a distance equivalent to the Moon's diameter across the sky every 180 years — while this may not seem like much, it is by far the fastest apparent motion of any star. The facilities used in this research were: HARPS at the ESO 3.6-metre telescope; UVES at the ESO VLT; HARPS-N at the Telescopio Nazionale Galileo; HIRES at the Keck 10-metre telescope; PFS at the Carnegie’s Magellan 6.5-m telescope; APF at the 2.4-m telescope at Lick Observatory; and CARMENES at the Calar Alto Observatory. 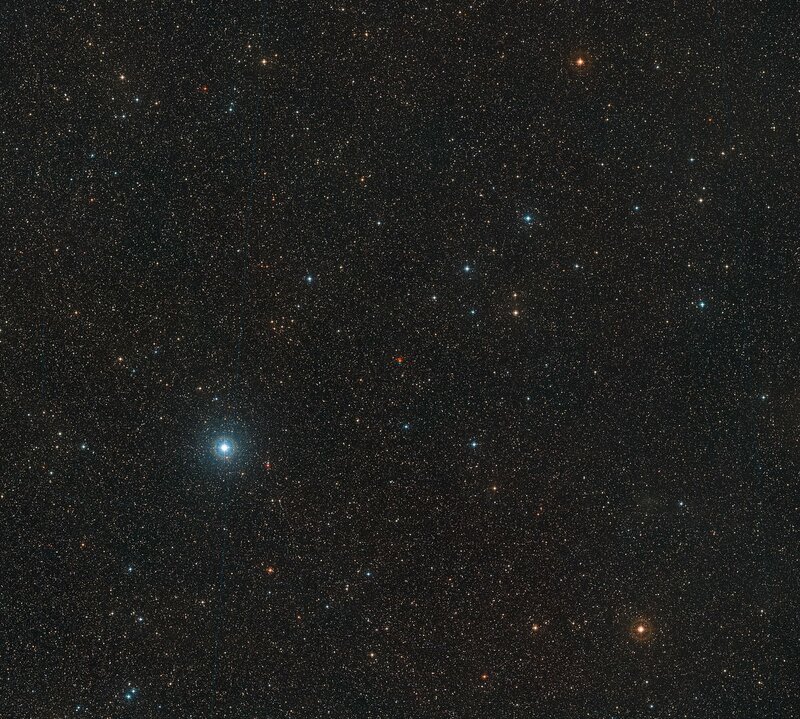 Additionally, observations were made with the 90-cm telescope at the Sierra Nevada Observatory, the 40-cm robotic telescope at the SPACEOBS observatory, and the 80-cm Joan Oró Telescope of the Montsec Astronomical Observatory (OAdM). This research was presented in the paper A super-Earth planet candidate orbiting at the snow-line of Barnard’s star published in the journal Nature on 15 November. The team was composed of I. Ribas (Institut de Ciències de l’Espai, Spain & Institut d’Estudis Espacials de Catalunya, Spain), M. Tuomi (Centre for Astrophysics Research, University of Hertfordshire, United Kingdom), A. Reiners (Institut für Astrophysik Göttingen, Germany), R. P. Butler (Department of Terrestrial Magnetism, Carnegie Institution for Science, USA), J. C. Morales (Institut de Ciències de l’Espai, Spain & Institut d’Estudis Espacials de Catalunya, Spain), M. Perger (Institut de Ciències de l’Espai, Spain & Institut d’Estudis Espacials de Catalunya, Spain), S. Dreizler (Institut für Astrophysik Göttingen, Germany), C. Rodríguez-López (Instituto de Astrofísica de Andalucía, Spain), J. I. González Hernández (Instituto de Astrofísica de Canarias Spain & Universidad de La Laguna, Spain), A. Rosich (Institut de Ciències de l’Espai, Spain & Institut d’Estudis Espacials de Catalunya, Spain), F. Feng (Centre for Astrophysics Research, University of Hertfordshire, United Kingdom), T. Trifonov (Max-Planck-Institut für Astronomie, Germany), S. S. Vogt (Lick Observatory, University of California, USA), J. 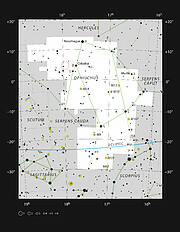 A. Caballero (Centro de Astrobiología, CSIC-INTA, Spain), A. Hatzes (Thüringer Landessternwarte, Germany), E. Herrero (Institut de Ciències de l’Espai, Spain & Institut d’Estudis Espacials de Catalunya, Spain), S. V. Jeffers (Institut für Astrophysik Göttingen, Germany), M. Lafarga (Institut de Ciències de l’Espai, Spain & Institut d’Estudis Espacials de Catalunya, Spain), F. Murgas (Instituto de Astrofísica de Canarias, Spain & Universidad de La Laguna, Spain), R. P. Nelson (School of Physics and Astronomy, Queen Mary University of London, United Kingdom), E. Rodríguez (Instituto de Astrofísica de Andalucía, Spain), J. B. P. Strachan (School of Physics and Astronomy, Queen Mary University of London, United Kingdom), L. Tal-Or (Institut für Astrophysik Göttingen, Germany & School of Geosciences, Tel-Aviv University, Israel), J. Teske (Department of Terrestrial Magnetism, Carnegie Institution for Science, USA & Hubble Fellow), B. Toledo-Padrón (Instituto de Astrofísica de Canarias, Spain & Universidad de La Laguna, Spain), M. Zechmeister (Institut für Astrophysik Göttingen, Germany), A. Quirrenbach (Landessternwarte, Universität Heidelberg, Germany), P. J. Amado (Instituto de Astrofísica de Andalucía, Spain), M. Azzaro (Centro Astronómico Hispano-Alemán, Spain), V. J. S. Béjar (Instituto de Astrofísica de Canarias, Spain & Universidad de La Laguna, Spain), J. R. Barnes (School of Physical Sciences, The Open University, United Kingdom), Z. M. Berdiñas (Departamento de Astronomía, Universidad de Chile), J. Burt (Kavli Institute, Massachusetts Institute of Technology, USA), G. Coleman (Physikalisches Institut, Universität Bern, Switzerland), M. Cortés-Contreras (Centro de Astrobiología, CSIC-INTA, Spain), J. Crane (The Observatories, Carnegie Institution for Science, USA), S. G. Engle (Department of Astrophysics & Planetary Science, Villanova University, USA), E. F. Guinan (Department of Astrophysics & Planetary Science, Villanova University, USA), C. A. Haswell (School of Physical Sciences, The Open University, United Kingdom), Th. Henning (Max-Planck-Institut für Astronomie, Germany), B. Holden (Lick Observatory, University of California, USA), J. Jenkins (Departamento de Astronomía, Universidad de Chile), H. R. A. Jones (Centre for Astrophysics Research, University of Hertfordshire, United Kingdom), A. Kaminski (Landessternwarte, Universität Heidelberg, Germany), M. Kiraga (Warsaw University Observatory, Poland), M. Kürster (Max-Planck-Institut für Astronomie, Germany), M. H. Lee (Department of Earth Sciences and Department of Physics, The University of Hong Kong), M. J. López-González (Instituto de Astrofísica de Andalucía, Spain), D. Montes (Dep. de Física de la Tierra Astronomía y Astrofísica & Unidad de Física de Partículas y del Cosmos de la Universidad Complutense de Madrid, Spain), J. Morin (Laboratoire Univers et Particules de Montpellier, Université de Montpellier, France), A. Ofir (Department of Earth and Planetary Sciences, Weizmann Institute of Science. Israel), E. Pallé (Instituto de Astrofísica de Canarias, Spain & Universidad de La Laguna, Spain), R. Rebolo (Instituto de Astrofísica de Canarias, Spain, & Consejo Superior de Investigaciones Científicas & Universidad de La Laguna, Spain), S. Reffert (Landessternwarte, Universität Heidelberg, Germany), A. Schweitzer (Hamburger Sternwarte, Universität Hamburg, Germany), W. Seifert (Landessternwarte, Universität Heidelberg, Germany), S. A. Shectman (The Observatories, Carnegie Institution for Science, USA), D. Staab (School of Physical Sciences, The Open University, United Kingdom), R. A. Street (Las Cumbres Observatory Global Telescope Network, USA), A. Suárez Mascareño (Observatoire Astronomique de l'Université de Genève, Switzerland & Instituto de Astrofísica de Canarias Spain), Y. Tsapras (Zentrum für Astronomie der Universität Heidelberg, Germany), S. X. Wang (Department of Terrestrial Magnetism, Carnegie Institution for Science, USA), and G. Anglada-Escudé (School of Physics and Astronomy, Queen Mary University of London, United Kingdom & Instituto de Astrofísica de Andalucía, Spain).